Effective February 1, 2008. Last updated June 3, 2018. 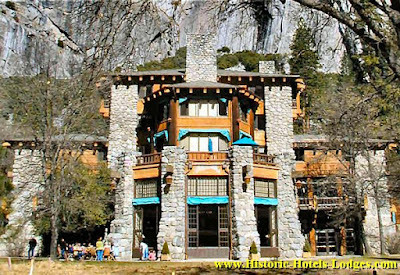 HistoricHotelsLodges.com and its owner and its authors, are referred to below as "this website." Why this website collects information on users. Information this website automatically collect is used to improve our website and to customize it to the individual user. Information you voluntarily provide (such as your email address, comments, and questions) is used to improve the website, answer your questions, communicate with you, insure that you are a real person (as opposed to a robot program), and assist you. Information automatically collected, possibly without your knowledge (nonpersonal information). Google and Amazon's use of advertising cookies enables them and their partners to serve ads to you based on your visit to this website and/or other sites on the Internet. Users may opt out of Amazon's personalized advertising by visiting Amazon's Opt Out Page. This website receives and records information from your computer and browser, including your IP address, some of your software and hardware attributes, and the webpage URL you are requesting. In most cases this information is automatically sent by your Internet browser to every website you visit. Email messages to and from us may be archived forever. Email Address Security. Do NOT use a private or sensitive email address when contacting us or registering on our website. When providing us with an email address you agree to use an email address that does not represent a security risk to you if disclosed. If our website, support, or email provider's computers are hacked, violated, broken into, etc. it is possible and probable that the email address you provide to us will be compromised and/or stolen. By submitting your email address to us, you agree that our liability for damages incurred by you in relation to the theft or use of your email address from us will not exceed 1.00 U.S.Dollar per email address. Users 17 years old and under. The content of this website is not directed at or intended for children under the age of 18. Some material on this website may not be suitable for children. Children under the age of 18 should only use this website under the supervision of a parent or guardian. How to change your personal information records. You can't change your non-personal information, however you can delete the connection between it and your computer. To delete it simply delete the cookies for this website and our advertisers from your computer. You may email us to request a change to any of your personal information. We do not honor requests to delete archived email messages we receive from you, we generally keep those to maintain a correspondence trail for our records. Unless otherwise noted, all of the content of this website is copyrighted by Jess Stryker, all rights reserved. The content of this website may not be modified in any way, published, displayed on a web-site other than this one, or sold in any form (printed or electronic), without the specific, written permission of Jess Stryker. Brief quotations may be used as allowed under USA and international copyright law. In such cases we request that the author is credited and the URL of the website is mentioned. By use of any or all of the information on this website you agree to be bound by the following sections titled; Disclaimer, Limitation of Liability Agreement, Dispute Resolution, and Reviews. If you do not agree, you must leave this website immediately and not utilize any of the content contained in it. To the maximum extent permitted by law, you agree to waive any claims against this website (including it's owner, Jess Stryker, or it's authors) arising out of the provision of information to you, except for the sole negligence or willful misconduct of this website. In recognition of the relative risks, rewards and benefits of the content to both you and this website, the risks have been allocated such that you agree to the fullest extent permitted by law, that this website's total liability to you for any and all injuries, damages, claims, losses, expenses, or claim expenses arising out of this service from any cause or causes, shall not exceed $100.00. Such causes include, but are not limited to, negligence, errors, omissions, strict liability, breach of contract or breach of warranty. You understand and agree that this website is not certifying, guaranteeing, or warranting anything. You and this website both agree to non-binding mediation as a first step of any dispute between us.